"Boeing management has not been particularly pro-active in its response," Argus says in a note. Argus downgraded Boeing to hold from buy on Tuesday after the second deadly crash of the manufacturer's top selling 737 Max. Boeing CEO Dennis Muilenburg on Monday, eight days after the crash, came out with a statement saying Boeing will maintain its "relentless commitment to make safe airplanes even safer." Argus Research downgraded Boeing to hold from buy on Tuesday, calling out the poor response from Boeing's management after the second deadly crash of a 737 Max plane. "Boeing management has not been particularly pro-active in its response, and we think the shares are subject to downward pressure as the investigation plays out in the news," Argus analyst wrote in a note on Tuesday. "We think the investigation is likely to cap multiples, and that earnings forecasts are likely to decline." Ethiopian Airlines Flight 302, a Boeing 737 Max 8, went down shortly after takeoff from Addis Ababa on March 10, killing all 157 people on board. Aviation authorities around the world grounded Boeing 737 Max planes last week after the crash. On Monday, eight days after that crash, Boeing CEO Dennis Muilenburg came out with a statement saying Boeing will maintain its "relentless commitment to make safe airplanes even safer." That statement came after French and Ethiopian investigators said data extracted from the black boxes of the Ethiopian Airlines jet showed "clear similarities" with a deadly Lion Air flight that plunged into the Java Sea in October. "In the near term, the company is struggling, along with aviation investigators, to quickly determine the cause of two fatal crashes involving the company's popular 737 Max jet. Until we get some clarity from investigators on the cause of the crashes, and from Boeing on its responses, we think a near-term HOLD rating is appropriate," Argus said. 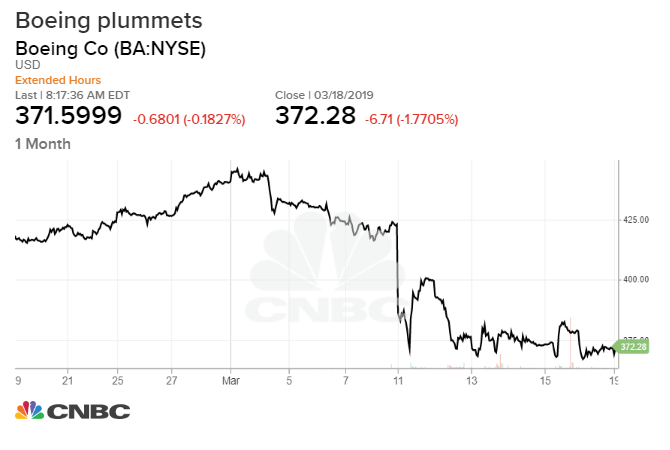 Shares of Boeing have dropped 12 percent since the crash on March 10. The stock posted its biggest weekly loss in eight years last week. "If the cause of the crashes turns out to be a mechanical or engineering issue, Boeing can correct the problem and the industry, which is heavily dependent on the plane, the 737 Max jet, can move on," the analyst said.